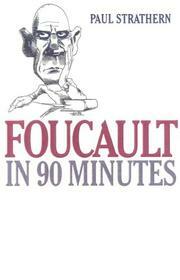 London-based writer Strathern (Berkeley in 90 Minutes, see above) offers a painless tongue-in-cheek introduction to French theorist Michel Foucault. Though ostensibly devoted to Foucault’s “life and works,” this slender volume concentrates on his biography rather than his ideas, for Strathern is more adept at giving readers a feel for the ambiance of Left Bank cafes and filling them in on Foucault’s relationship with composer Jean Barraque than, say, investigating his work on the history of sexuality. Did you know that, when Foucault taught in Sweden, most of his students were female? Or that, at 30, he drove a Jaguar and his hair began to thin? That he favored tartan suits and was an accomplished cook? Strathern offers an adequate summary of Foucault’s work on the penal system, and his thumbnail sketch of Foucault’s Madness and Civilization is mercifully oversimplified. Happily, there is almost no discussion of Foucault’s enormous influence in philosophy, literary criticism, linguistics, history, and sociology. Readers will come away with enough fascinating vignettes to get them through two or three cocktail parties—which is probably more than most of them will require.